Proceed from Johannesburg on the N12 towards Witbank, the N12 will become the N4 on route to Witbank, this is a toll road, with two toll points. The N4 continues through into Nelspruit. On entering Nelspruit follow the signs for White River on the R40, continue through White River following the R40 towards Hazyview, approximately 40KM. 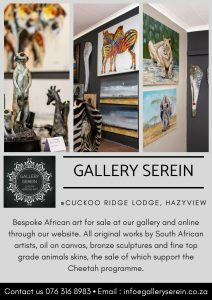 On reaching the T junction turn left towards Hazyview continue through Hazyview until you see the signs for Sabie, turn left along the R536 towards Sabie (on the corner is the trading post Perry’s Bridge) Cuckoo Ridge is 14KM along the R536 to Sabie on the left hand side. 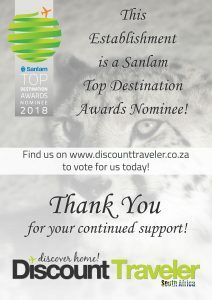 Follow the same route out of Johannesburg, pass Witbank. This route encompasses only one toll point. Turn left from the N4 onto the R540 at Belfast, follow the signs for Dullstroom and Lydenburg, in Lydenburg follow the signs for the R37 to Long Tom Pass and Sabie. In Sabie follow the signs for Hazyview on the R536. 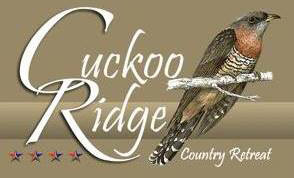 Cuckoo Ridge is 30KM from Sabie on the right hand side.